When you think of Greek cooking, the first thing you usually think of is a simply exquisite lemony soup with a little bit of rice in it, thickened by eggs. Greek food is a marvelous mixture of magnificent manna, appealing to all tastes, from grilled foods to layered casseroles and including those wonderful sweet delicate pastries wrapped in paper- thin, multi-layered phyllo wrappings. 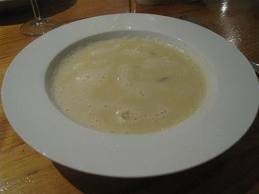 Just about any Greek restaurant or diner features Avgolemono soup because everyone loves it. But hardly anyone, other than Greeks, makes it at home. That’s a shame I think, because it is so delicious yet easy to prepare, requiring just a few ingredients (although some people add to it) and brief stove time. You needn’t wait for a Greek holiday celebration to enjoy this, make it in the middle of the week to precede a nice entrée followed by perhaps a bread or rice pudding. If you haven’t ever tasted it before, try it. you will soon be agog for avgolemono. Bring to boiling in a saucepan the chicken broth. Stir in the rice or orzo, lower the heat and simmer for about 10 minutes, after which taste for doneness. Remove the pan from the heat and let broth cool down. Crack the eggs into a large bowl and beat until mixed. Now, start beating again while gradually adding in the lemon juice. When the broth has cooled down, it is time to temper the eggs. While beating the eggs once again, slowly add about 2 cups of the still hot chicken broth to them, pouring in a slow thin stream. This method insures that the eggs absorb the liquid without getting “cooked” too soon. With a fork, stir the rice or orzo and remaining broth vigorously while pouring all of the egg mixture into the saucepan. Continue stirring until the soup thickens a little, but use very low heat; you do not want to bring to boiling. Serve the soup as soon as thickened. Enjoy this culinary gift from the Greeks. Oh my goodness. I'm so hungry now. This sounds good! enjoy the A to Z challenge! Looks yummy. I shall give it a try, although cooking is not my forte! Thanks for the recipe. Sounds/looks delish. Serve it with a little (Not I don't know how to spell either of these words) Kletdeco or Chamico. Hey??? A to Z for recipes, sounds like a blog I need to follow. Can you teach my husband to cook? What a treat that would be. Recipes from A-Z. Great concept! I agree with Better, though, in that cooking is not really my specialty department. Love this idea...A-Z recipes. My daughter has a Greek boyfriend and he makes this but I didn't know the name. Thanks for sharing the recipe! I enjoy cooking so will give it a try! @Miss Sylvia: Thank You for your comments. @Miss Nicki: Thank You for your comments. Don't be nervous about tempering; all you are doing is adding a LITTLE hot liquid into the yolks so they can used to it without being overwhelmed. Once you do it, you can do it. @Dear Baygirl: Thanks for visiting. Av Go Lemon Oh. It's good. reads pretty interesting...hope you've met Livya @ eatgreek.net.